I've been nursing a battered and bruised body this past week, after falling down my front steps ...... all eleven wooden steps ....... a week ago yesterday. I was attached to Dream by a leash as she chased a squirrel off the verhandah ...... para-sailing down the first half, I landed on my back and bumped from step to step on the second half ...... ending up with a sore back, two bruised elbows, a bruised and swollen left ankle, and one battered toe on my right foot. No broken bones, and no snapped neck ........... it's apparent to me that God doesn't want me in Heaven quite yet! I'm healing well and slowly getting back on the computer. Finally felt like knitting this morning so I started the second sock to the latest pair that I am making for Heather. 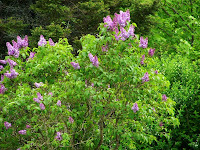 My lilac bush in bloom earlier this month. Oh no!! Hope you heal fast! Oh, dear! Tell Dream to be more careful of her Mama! Your lucky not to have been more seriously hurt, take care, sending healing vibes your way. Hello Cathy, Leslie & Aussie Stitcher ....... Thank You all ... I am healing well, and I hope to never repeat the act!